...that I'm thankful for these lilies? 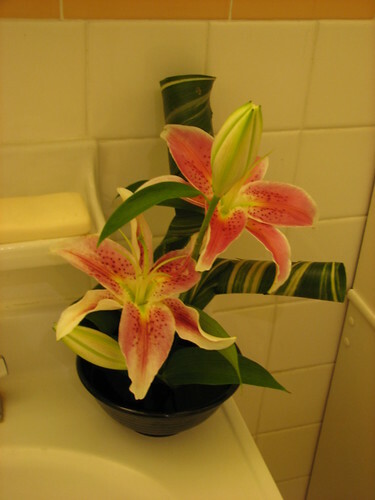 They were left over from my ikebana class on Tuesday, and they've made themselves at home in the bathroom. They look terribly out of place on the tiny corner of countertop in the most run-down and dated of all our rooms, but they are masking the smell of mystery-misplaced little-boy-pee very nicely. I'm coming to the realization that I'll be living with that smell for a long, long, long time yet. I may need to start buying lilies wholesale. I just laughed and laughed and laughed. I know my turn is coming but I can still laugh right now. Your flowers are beautiful. Did you arrange them yourself? I love the look. I love your flower arranging. Looks awesome! Those are beautiful!! Absolutely gorgeous. I love lilies. yes, another thing I "balked" at (like you afore said mentioned) before having kids: mystery-misplaced little boy pee). Man, potty training is not easy! Beautiful stargazers. You are one talented lady!!! Oh and all you have to do is spray the whole area around your loo with febreeze. Trust me.